Freddie Nelson’s fits and starts of metallic picking and feedback on “Turn You On,” begin his brilliant album, Shake The Cage. Here we get a collection of full rich pop rock confection showcasing Nelson’s high clear voice, guitar playing, and expert songwriting. And this is just from the first tune out of 11! There’s a 50s mixed with Queen sensibility on the big sway of “Light.” Again the backing vocals creating quite a rich tapestry as much as Nelson’s strong controlled electric guitar leading. “Let You Go” is a love-gone-wrong heavy lament, again with a clever bridge and singable poppy choruses. This one built around a main riff, and drummer Thomas Lang’s straight ahead snare snapping. Meanwhile there is a big stomp to “My Girl,” which follows; a real nasty read from Nelson, driving into, once again, a layered vocal chorus. “Monster In My Room” and “For Those Who Die” ends. “Monster” is an acoustic ballad, about a girl who may or may not be what she seems to me; again great Queen-like layered vocals and a lyric that is playful and not at first go round so easy to understand. On “Monster” he manages one of his most expressive leads too. “For Those Who Die,” employees a flicky picked guitar attack as we come back to how we began here, all quick running guitar power chords, strikes and Nelson singing clear-as-a-bell above it all. 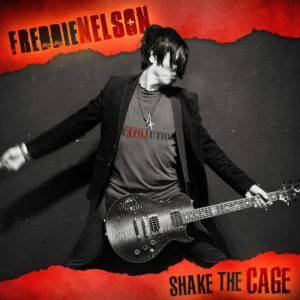 One could place Freddie Nelson among any of the excellent pop rock acts of the 70s, this is the vein he is ming so perfectly and with true style. Shake The Cage is damn good fun.